Very nice footstool and good quality. However, the cushion color states this pattern is 'orange' upon opening the cushion , it is not orange but a coral. Had to return because I want orange, but otherwise good product! Liven up your patio or indoor living area with the bold prints and casual style of an island paradise. The tufted cushion is filled with recycled poly-fill for a comfortable and soft seat that can withstand the outside elements. The spun polyester fabric is available in several different prints so that you can mix and match to make your own unique set. The frame of this International Caravan outdoor ottoman is made of rattan finished with lacquer and java stained brown finish for a tropical look to go with the spun polyester cushion. Use it without the cushion to hold appetizer or drink trays. The sturdy construction and durable fabrics are made to last. Complete set includes (1) Bali rattan ottoman foot stool frame and (1) Blazing Needles indoor/outdoor water resistant cushion of your choice. Great addition to papasan chairs, rattan swivel rockers, and other elegant and casual rattan decor. Got this little print ottoman to go with the papasan chair. The print adds color and fun to my room. It acts as an ottoman, stool for my little ones and table for book, remote, etc. The quality is very good, colors vibrant, frame sturdy and finish nice and rich.Glad I made the decision to get this piece to accompany my chair, as I did not originally plan to. Would not hesitate to recommend Overstock for home goods, and have, in fact, already. Thank you, Overstock!! These ottomans are a perfect height for relaxing and putting your feet up either inside or outside. Not too big or cumbersome, lightweight and nicely made. The fabric I chose is bright and cheerful. They are a good value for your money. They arrived faster than expected and were well-packed. There were some scrapes on the wood and a nail on the frame was sticking out, not excellent but very good. We have a vacation home in the desert that has rattan furniture. needed an ottoman and found this one. great color choices for cushion. matches the rest of the furniture well, nice addition to our home. only thing could make it better was more of a lip or ties to hold cushion in place. as is, kind of moves around a wee bit. still, for the price, color, quality i would buy a second one just like it. Bought this cushion to match the 2 replacement Blazing Needles chair cushions that I also purchased from Overstock when we were redoing our outdoor seating area. Great quality cushion and so nice to be able to find matching pieces! Have had it for a whole season now and it looks like it did when it was brand new. Awful construction, flimsy, not stable! This looks nothing like the photo. The paint stain was a reddish color instead of a brown hazelnut color. Also the paint stain was spotchy and poorly applied. And the ottoman is unstable. It easily falls over when you try to put your feet on or take your feet off. Terrible. Returned it. Well made and a good value! I love the print on the fabric! I'm using this ottoman outdoors. So far, the color and condition has remained impressive. We had a very wet summer and the ottoman held up well through all the soakings it took. The fabric and construction are both of good quality. When the weather was good, it was a perfect place to rest my feet while I sat and enjoyed the outdoors. Using it outdoors on my patio. It is very nice construction. I bought 3 of these to use as foot stools with my outdoor sectional. I leave the base outside all summer and put the cushions in a storage container when I'm not using them just so they won't blow away. Very comfy and the perfect height. Kids can even use them as a stool. Comfortable. Get a cushion that ties on or Velcro the one they sell to it. pillow cushion was not round like the stool, so didn't fit properly. overall poor quality. Nice little footstool. This is the second one I've bought. I like the papasan/wicker look, it goes with my nature-inspired decor. I have one indoors and one outside on a covered balcony. A chancey decission but i pulled it off with the rest of my color decor in living room. Breaks it up. Sturdy and not cgeaply made. I reccomend for sure and have. Love the design and sturdiness. Don't care for positioning of the cushion. It should have been made smaller to fit. Love it so much I want another. Very happy with the foot stools, love the cushions, colorful and very soft but they retain their shape. I like that the cushions are not attached so I can bring them in even though they can stay out doors. "what is the name of the cute orange color? I can't figure out which name goes with what color. Help!" "Can you keep this in rain? Is this made of wood?" 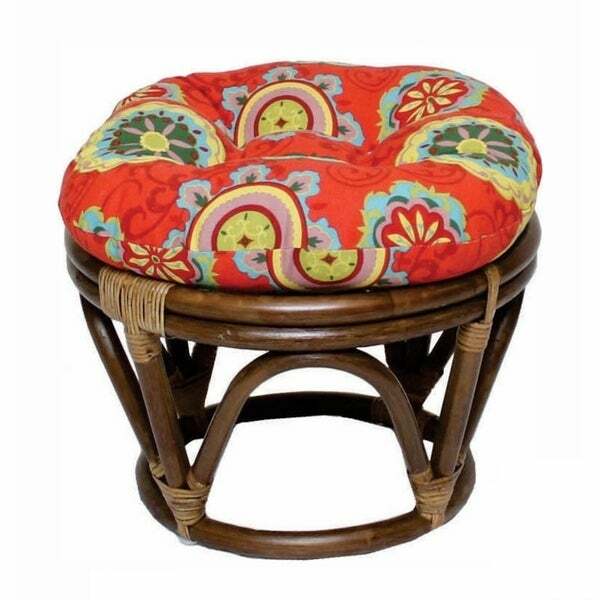 "Is there an opinion to buy only the round cushion for the ottoman? I purchase the ratton chair cushion but need a matching ottoman cushion as well. Thanks,"
Hello Kasper, this cushion is not sold separately. We apologize for the inconvenience. Thank you for shopping with us! I wanted an ottoman to match the chair. I need a replacement cushion. "We are thinking of using these for additional seating. Can you please tell me the weight load they can handle? Thank you." Thanks for your interest, unfortunately these chairs have not been weight tested, typically these type of chairs will hold approx 250 lbs.